I’ve been meaning to buy a Bundt cake tin for a while now, and when I came across a recipe in The Clandestine Cake Club book, I was compelled to go out and buy one straight away. 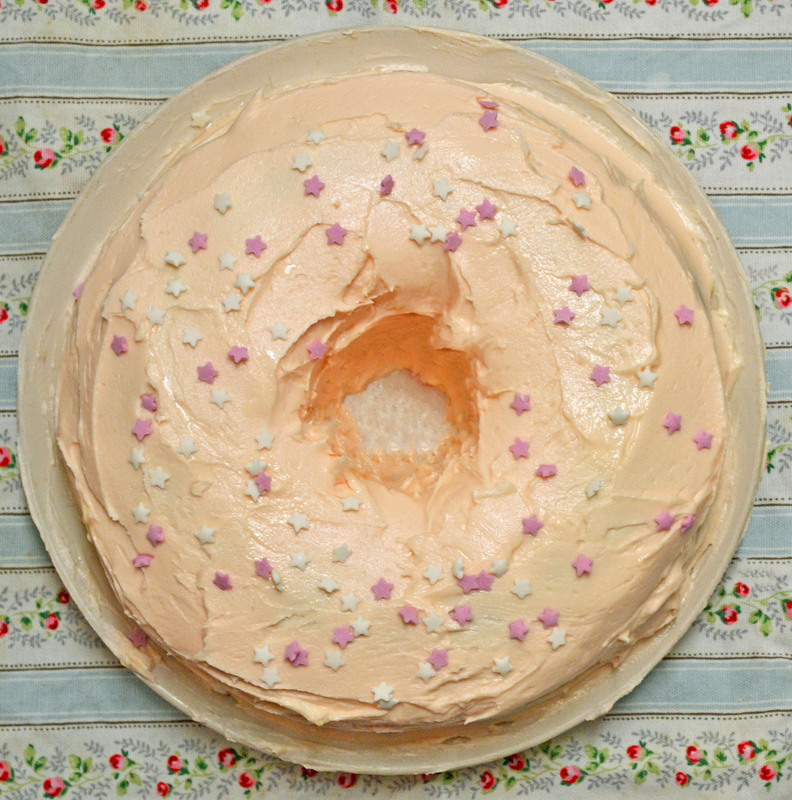 The recipe was Raspberry Yoghurt Birthday Bundt Cake. 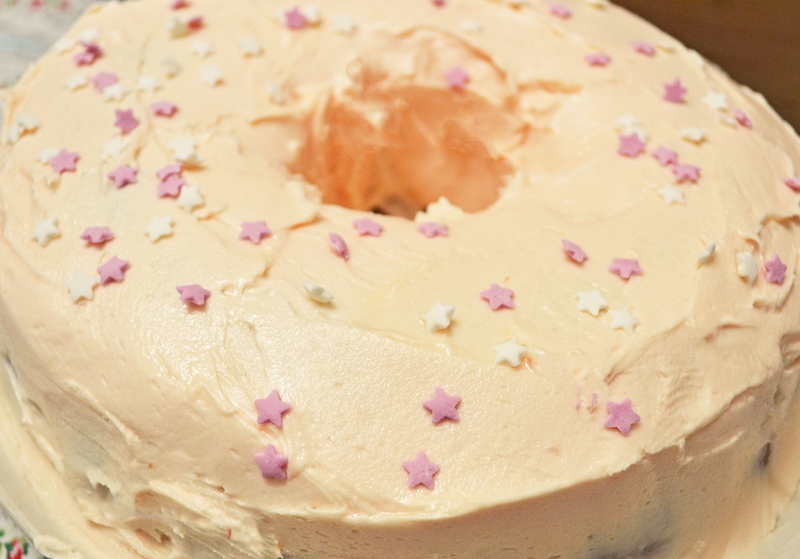 The icing was a lovely bright pink colour and with raspberry being one of my favourite flavours I knew I had to try it. The problem was when I went to buy the raspberry yoghurt there was none, so I made a snap decision to get cherry yoghurt instead, another favourite of mine. 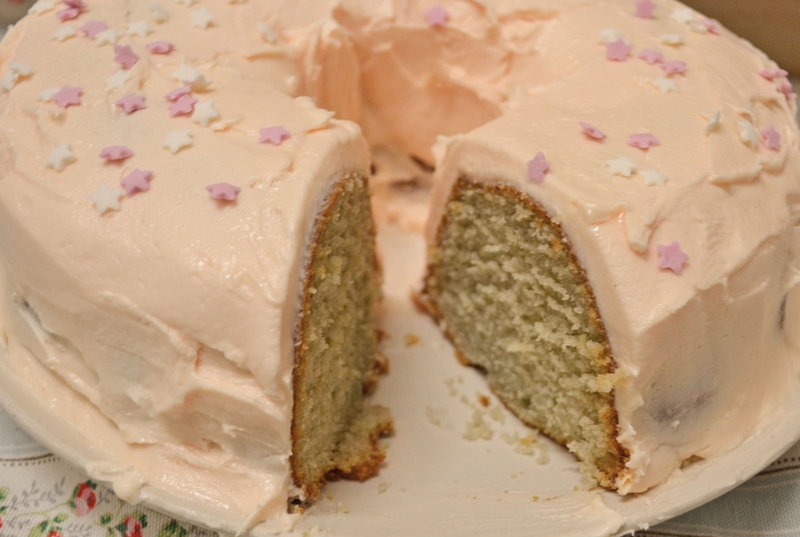 I was pleasantly surprised how the cake turned out as I was not sure quite what to expect. Despite the only raising agent being 1/2 teaspoon of bicarbonate of soda it was light and fluffy and yet had a delicious moistness from the yoghurt. It took longer to make than I thought it would as the cake needs to bake for an hour in the oven, you then have to wait for it to completely cool before you turn it out, I’m guessing so it doesn’t break apart? The recipe said to use vanilla essence but because I was using cherry yoghurt I thought it would be quite nice to use almond essence instead. I also flavoured the butter icing with a couple of drops of the almond essence which made it taste so good! Please excuse the not so good pictures, by the time the cake was finished the lighting was not so good. Being more of a pastels sorta gal I decided to just add a hint of pink food colouring, but you could have some real fun with the colours! The recipe suggested this was a birthday cake, and it would be a bit different. I would say it’s a healthier option because of the yoghurt but there was 225g of butter in it which was rather a lot, despite that it didn’t taste greasy, although I did have to pat it down with a kitchen towel once it was out of its tin. 3. Add the eggs one at a time beating well after each addition, adding a tablespoon of flour with the final egg to help prevent curdling. 4. Mix the remaining flour, bicarb and salt in a bowl. In a separate bowl mix the yoghurt and almond essence. 5. Sift a third of the flour mixture into the egg mixture and stir until just combined, then add half of the yoghurt mix. Repeat until everything is combined. Mix on a low-speed for about 15 seconds or beat with a wooden to spoon to give it a good mix. 6. Transfer the mixture to the tin, spreading evenly. Bake for 1 hour or until a skewer comes out clean when inserted into the centre. Leave to completely cool in the tine before turning out. 7. To make the frosting, beat the butter until softened, then gradually sift in the icing sugar until well combined, adding the milk to get your preferred consistency. Add the almond essence and food colouring and beat well until light and fluffy. Spread over the entire cake and decorate as desired.